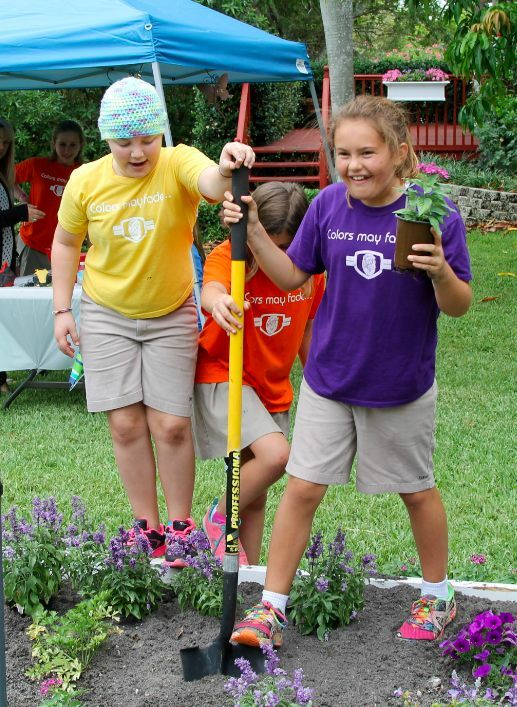 Randall and friends plant flowers during the Seeds of Hope event. Fourth grader Randall Grenadier became the face of courage for students at Grandview this spring. Randall is fighting a rare form of kidney cancer called Wilms Tumor for the second time– a fight which involves rounds of chemotherapy, several weeks missed with her friends at school, and of course, a huge time and financial commitment by Randall’s family. “We wanted to help our friend,” said classmate Elle Buckley. Elle and several other students hoped to do something for Randall to encourage her and to help her family– that’s how Seeds of Hope began. Students spent the month of May making bracelets and keychains and practicing for the talent show. With the help of parents Celina Poole and Zoe Greenberg and a donation of over $1,000 worth of flowers from Home Depot, the Seeds of Hope event raised over $12,500. Attendees enjoyed shaved ice from the Kona Ice Truck, purchased the teal bracelets and keychains, and planted flowers in honor of Randall. Talent Show participants take a bow with Randall at center stage. students participated in sixteen acts, including comedy, dance, and music– with Randall in a front-row seat in the standing-room-only Great Room. Courage was the word of the month for our lower school students– and because of Randall and Seeds of Hope, every single student can tell you exactly what courage means. Tags: Community, courage, fundraiser. Bookmark the permalink. This wonderful and incredibly brave teenager, Randall Grenadier, has past over, Saturday February 2, 2019, losing her fight with cancer, leaving behind changed hearts forever. 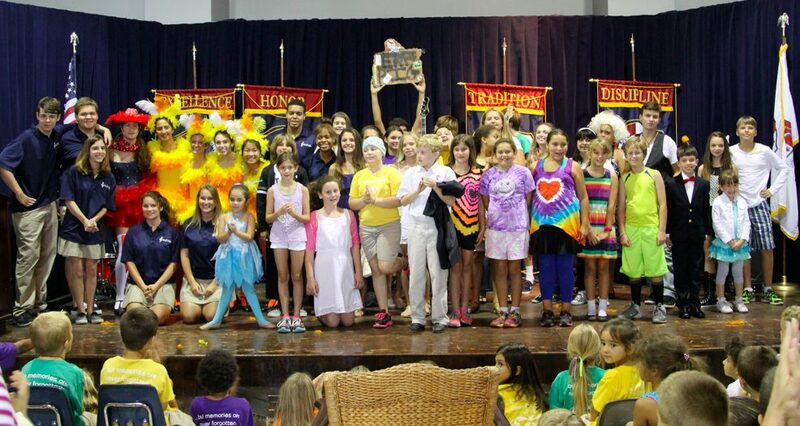 The Kemp Palaigos Family of Calabasas, CA, now residing in Boca Raton, FL, have been direct supporters of the St. Jude’s Children’s Research Hospital, since 2007, as Nikki Palaigos, notably, the youngest supporter at the age of 4, demonstrating empathy clearly has no age limit, as she then described her personal pain was caused by a sick family member which she felt by choosing to support St Jude’s Children’s Research Hospital she could help stop other families from feeling the same pain. At 14 yrs old, this empathy created the bridge and tight connection between both Randall and Nikki P upon first meeting. Today at 15 years old, Nikki P. along with several present/former Grandview Prep School Students, are forever impacted by the loss of their young, courageous and most impressionable friend, Randall Grenadier. Randall Grenadier had introduced herself to us after the one of the first JV Girls Volleyball Team practices @ Grandview Prep School, by welcoming our family to the 8th grade class Fall 2017. This warm, bubbly, vibrant young lady, shared her prideful excitement of her newly found friend in Nikki P., describing with excitement and joy, the appreciation she had for her new friend. That day Randall described her most recent experience on the volleyball court, imprinting this moment as most special and memorable to us, displayed shortly after our first meeting, as this incredible young lady exposed her true essence by utilizing her inner strength to promote a change through an “Act of Integrity”. We recognized Randall Grenadier’s incredible Inner-Strength beauty when she created a Petition to correct a strongly felt injustice experienced by Randall and her immediate fellow participating teammates, inspiring them all to support a proposed correction by signing a petition. Any signatory assumed the potential negative consequences that could follow a petition of such a controversial nature, yet they decided to exercise their freedom of expression which we, as parents, found inspiring as this action Randall generated was not careless in fact, we found it was extremely brave and felt she was teaching our young teens to stand up for themselves. For this publicly noticed act of a controversial nature, we expressed our associated pride by this students initiative to exhibit the conspicuous, unwavering morality, which prompted our daughter to conjoin expression through participation in this petition, as this self confidant, influential student, we found to be a positive role model. We found this “Act of Integrity”, was priceless, therefore today, we are acknowledging publicly, our gratitude and appreciation in memory of this incredible young lady, Randall Grenadier, for the demonstration, introducing her peers and adults alike, to an exhibition of Leadership through her stance, exercising Integrity. We also must thank Randall Grenadier’s parents for sharing their miracle of life, as their teen daughter’s essence was unquestionably inspirational and who was a life-changing force for all who’ve had the honor to experience during her short time engaged here on earth. So true of our beloved Randall Grenadier, who was pure of heart and most beautiful in the moments we met… this is not the end but the beginning of your next impactful journey. We all send Randall off with our love and warmth, meanwhile looking after her family during their time of need while their hearts break from their great loss. Until we meet again.